More than 3,000 Scientologists and friends gathered in Clearwater, Florida for the grand opening of two landmark buildings on Saturday, June 25, 2016—the West Coast Building and the Flag Crew Administration Building. The West Coast Building was originally constructed as the West Coast Hotel in 1927. This historic landmark was considered one of the finest boutique hotels in Florida. Cheers erupted as Mr. David Miscavige took the stage to dedicate two landmark buildings in downtown Clearwater. Saturday, June 25, saw over 3,000 Scientologists and guests converge in downtown Clearwater to celebrate the latest expansion of the Flag Land Base. Yet another milestone in the continuous efforts of the Church to beautify downtown Clearwater, the Flag Crew Administration Building opened June 25. Two ribbons fell on Saturday, June 25, one on the West Coast Building, the other on the Flag Crew Administration Building, and both to celebrate the grand opening of key facilities for the managing and administration of the Scientology spiritual headquarters. Mr. Miscavige led the dedication ceremony that marked the latest chapter of the Church’s expansion at Flag. 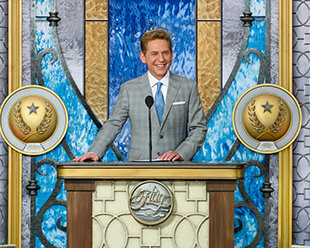 In his closing remarks Mr. David Miscavige welcomed all in attendance to tour the new West Coast Building and Flag Crew Administration Building. The West Coast building stands on the city’s Fort Harrison Avenue in the heart of downtown Clearwater. The landmark has been restored and transformed to accommodate the local ecclesiastical management who plan and administer for continuous expansion across the Flag Land Base. Constructed in 1927, the West Coast Building’s historical façade is now restored including the decorative ironwork window baskets and exterior awnings. The West Coast Building’s reception features the original terrazzo floor, mahogany beams and intricate ceiling plasterwork—all now restored. Among the fine details preserved in the building’s lobby are the filigree plaster ceiling designs and carved granite fireplace. The Church’s conservation work extended to the building’s original hand-operated elevator, the oldest and most historic of its kind in Florida, and now completely restored and operational. Beyond the lobby, the elegant conference room accommodates coordination meetings for activities across the Flag Land Base. The West Coast Building is also home to coordinating offices for the Church’s social betterment activities devoted to uplifting the community of Clearwater. The Flag Crew Administration Building houses operations that create the “Flag experience” for parishioners visiting from 60 nations. Flag has expanded from two buildings in 1975—the Fort Harrison and the Clearwater Bank—to 55 structures. And the staff at the Flag Crew Administration Building keeps all of those operational and maintained at peak quality. The expansive lobby will welcome local businesses and vendors meeting with Flag staff charged with maintaining multiple religious retreats including the historic Fort Harrison. The ground floor features several conference rooms for the planning of local activities, international conventions and banquets. The West Coast Building and Flag Crew Administration Building, stand at the top of the Fort Harrison downtown corridor, now transformed by the Church’s sustained efforts to beautify the city of Clearwater. Church of Scientology in Clearwater celebrates the dedication of new facilities at international spiritual capital—Flag. A pair of classic downtown Clearwater buildings was the focal point as 3,000 Scientologists and their guests converged in the city on Saturday, June 25, 2016 to witness the latest chapter in the Church’s expansion. The massive crowd gathered as two ribbons fell in unison for the grand opening of the West Coast Building (WB) and the Flag Crew Administration Building, formerly known as the Lee Arnold Building. The two buildings share an expansive lot that stands on the city’s main thoroughfare, Fort Harrison Avenue, in the downtown core. Together, they represent key facilities for the managing and administration of Flag. The West Coast Building is home to the local ecclesiastical management who plan and administer for continuous expansion across the Flag Land Base. The facility is also home to coordinating offices for the Church’s social betterment activities devoted to uplifting the community of Clearwater. Built in 1927, the 17,575-square-foot WB was originally called the West Coast Hotel—and it was considered one of the finest boutique hotels in Florida. The hotel hosted events as varied as the Miss Florida Pageant and the Philadelphia Phillies during spring training. The Church purchased it in 1981. Historic elements of the West Coast Building have been meticulously restored, from its distinctive façade and decorative ironwork window baskets, to its new 12-paned traditional windows; and from the original terrazzo flooring and mahogany ceiling beams of its elegant lobby to its green terracotta roof and exterior awnings. The Flag Crew Administration Building houses operations that create what’s come to be known as the “Flag experience” for parishioners visiting from 60 nations—that’s everything from maintaining multiple religious retreats including the historic Fort Harrison, the Oak Cove and Sandcastle; to running a dozen parishioner restaurants and cafés headed by Gold Medal Chefs; and planning banquets and conventions that host over 27,000 people each year. Flag has expanded from two buildings in 1975—the Fort Harrison and the Clearwater Bank—to 55 structures. And the staff at the Flag Crew Administration Building keeps all of those operational and maintained at Flag quality. The 21,000-square-foot Flag Crew Administration Building dates from 1958, and has been home to various downtown businesses and organizations including the Clearwater Library. The structure’s appearance diminished over the years—but the Church, which purchased it in 2013, has restored the building to its original streamlined character. A year ago, the Church rededicated the Clearwater Bank building after a thorough renovation of one of the most historic structures in the city. It now houses an inviting information center that offers visitors audio-visual displays about Scientology, Dianetics and the religion’s founder, L. Ron Hubbard. At the same time, the Church opened six completely renovated buildings along Fort Harrison Avenue, each committed to a single global humanitarian initiative and devoted to the betterment of Clearwater, comprising: Scientology Volunteer Ministers, the Citizens Commission on Human Rights, United for Human Rights, Foundation for a Drug-Free World, The Way to Happiness and Criminon. That ceremony also marked the unveiling of the Osceola Courtyard—a green oasis beautifying the corner of Fort Harrison and Drew Street, and home to events for the Clearwater community. Also in the name of community and social betterment, in November, the new Model Narconon Suncoast opened on 7.5 acres, a few minutes north of the downtown area. The drug rehabilitation center is one of a growing number of facilities employing the groundbreaking technology pioneered by Mr. Hubbard. And in April of this year, the transformed Applied Scholastics Community Learning Center opened its doors to the city. The new model tutoring center offers literacy programs based on the research and writings of L. Ron Hubbard, and its goal is the betterment of all Clearwater residents. And renovation of an additional 15-building apartment complex also for the ministry. Scientology has enjoyed greater expansion during the past decade than in the previous 50 years combined. The number of new Ideal Church Organizations now stands at 51, with an Ideal Organization for Atlanta, Georgia opened in April, 2016. More new Churches are scheduled to open in the coming weeks and months in Budapest, Hungary; Harlem, New York; Sydney, Australia; Auckland, New Zealand; and San Diego, California among others across the U.S.